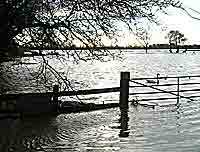 There was really serious flooding all over the country in late October/November 2000, and again in December, but St Ives escaped comparatively lightly, although the river rose considerably and surrounding fields were submerged. 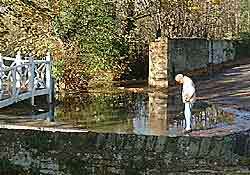 In January 2003, pictures of the flooded area in front of the old mill were even featured in the national news - although in fact it was the commonly flooded part (below) that was shown. 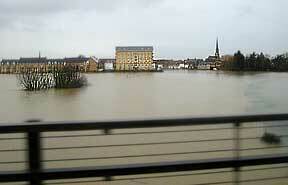 January 2003: the view from the Cambridge bus on the bypass leading from the A14 to the town. Most of this is usually green field with the river running behind the other side of the bushes on the left, and past the mill. 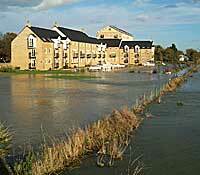 But it forms part of the main flood plain, so is often flooded. 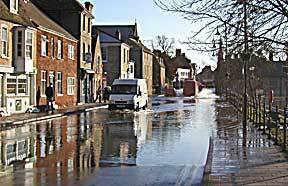 January 2003: flooded drains in Whitecross, near the parish church. The Waits at their worst. 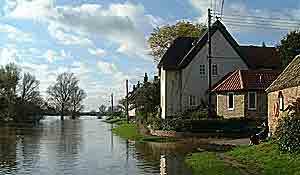 Water from the river on the right reaches right across the road. Photo kindly supplied by Paul Goates. 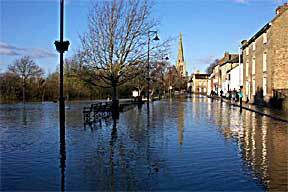 The floods begin to recede: The Waits, looking towards the parish church, and then looking the opposite way towards the town. Notice the sandbags in front of the buildings in the picture on the right. 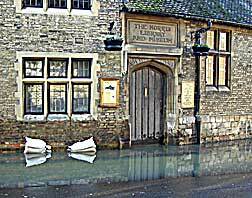 There was no easy access to the front door of the Norris Museum which was surrounded by water on three sides, instead of just having the river behind it. 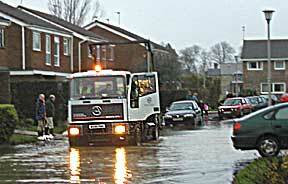 There are also 2003 floods photos on my Latest News (2) page. 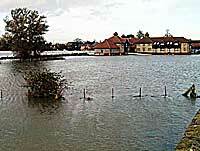 The Dolphin Hotel car park, which forms part of the flood plain, was submerged as usual. The building on stilts is part of a recent extension. Some residents wondered if it had really been such a good idea to go on building here. Above left: this was more surprising: Nobles field was completely submerged. Above right: the St Ives end of the Thicket Path (to the left of the wall), leading past Nobles Field to Houghton, was covered in water. Overflowing water from the river reached the new marina by the old mill. Are these apartments other buildings that should never have been erected? 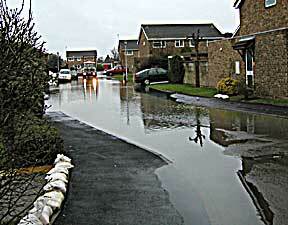 Holywell (4 miles from St Ives): this part of the road in front of the houses along the front was completely submerged. 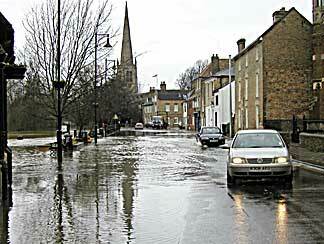 Move on to FLOODS 2, with Geoff Soden's aerial photos taken in January 2003.